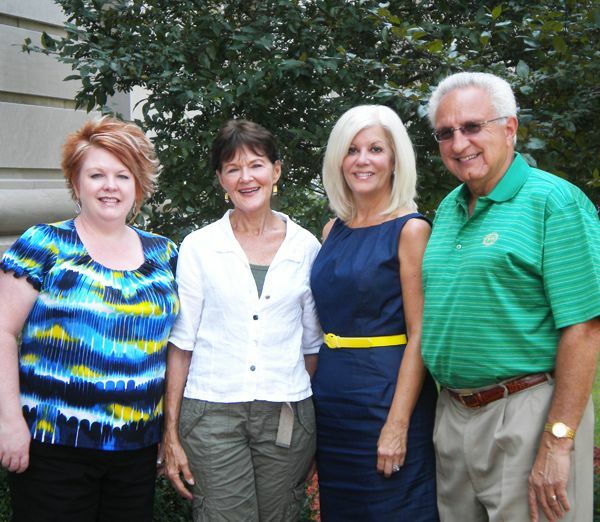 Wheeling resident and businesswoman Mary Beth Hughes, second from left, will be honored for her community voluntarism by the Wheeling campus Friends of the College and the Foundation of West Virginia Northern Community College during the annual fund-raising dinner to be held Oct. 29. Hughes meets with dinner coordinators, from left, Rebecca Yesenczki, administrative associate; Emily Fisher, Foundation executive director; and Nick Zervos, president of the board of the Wheeling Friends group. Planning is well under way for the upcoming Wheeling campus fund-raising dinner at West Virginia Northern Community College that will honor an outstanding community volunteer, Mary Beth Hughes. Sponsored by the Wheeling campus Friends of the College group and the WVNCC Foundation Inc., the annual dinner is scheduled for the evening of Saturday, Oct. 29, at the Education Center building at 17th and Eoff streets downtown. The dinner has been held in the Education Center lobby, Culinary Arts dining room and multi-purpose room since the building was renovated and opened to the public in 2006. As is tradition, food at the reception and banquet will be prepared and served by the WVNCC Culinary Arts department and students. There will be musical entertainment, silent and live auctions and several surprises related to the dinner’s theme, Hooray for Hollywood: An Evening with the Stars. The Friends and Foundation boards have numerous dinner sponsorship levels available and believe the community will respond generously as has occurred in the past. Owner and interior designer at Hughes Design and Hughes Gift Gallery in Wheeling, Mary Beth has been described as one of the hardest working community volunteers in the area. Her service includes membership on the Foundation boards of Sandscrest and West Virginia Northern Community College, where she has served as board president. She is a past president of the Board of Directors of the Wheeling Symphony and serves on the boards of Elmhurst and King’s Daughters. She is a sustaining member of the Junior League of Wheeling, where she served as president from 1971-1973, and is a member of Wheeling Rotary, where she is a Paul Harris Fellow. Statewide, Mary Beth is a member of the West Virginia Governor’s Mansion Preservation Foundation, where she serves as chair of the Furnishings and Decorative Arts Committee. Hughes served one term as president of the Pennsylvania West Chapter of American Society of Interior Designers, which also includes northern and central West Virginia. A professional member of the ASID and the International Interior Design Association, Hughes is certified by the National Council for Interior Design Qualification. Having attended Randolph-Macon Woman’s College, she graduated with high honors from West Virginia University, and received an associate in applied science degree from the Art Institute of Pittsburgh, with a major in Interior Design. After her graduation from WVU, Hughes taught high school French for six years in Charleston, Moundsville and Glen Dale. Upon completing the course of study at the Art Institute in 1981, she began her own design firm in Glen Dale. In 1984, she was appointed director of architectural design at Boury, Inc., in Wheeling, where she designed restaurants and hotels in Pittsburgh, Columbus, Rochester and Syracuse, N.Y., and in Detroit. In 1988, Hughes spent a year as head of the interior design department at Stone and Thomas. The current Hughes Design and Gift Gallery has been her “home” since 1991, when she purchased the former Rybeck Interiors building on National Road in the Fulton area of Wheeling. Hughes has been a guest lecturer at the Art Institute of Pittsburgh, and was the first person honored as A.I.P. Interior Design Alumni of the Year in 1993. Hughes lives in Wheeling, and is the mother of three grown children, all of whom work in somewhat creative fields. Molly lives in Philadelphia and New York, doing art direction and set design for films and the theatre. Justin is an architect and engineer in Atlanta. Chad is a cardiac surgeon in Durham, NC.